Online Dating Tips: How to Get Back Online Now and Find Someone who interests you! 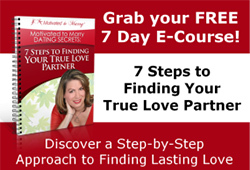 If you ever have felt like you are the only one who has put a lot of time and energy into finding true committed love and not getting the results you desire, you are not alone! The survey I did last week reveals some of the main challenges that singles struggle with. Today is the ten year anniversary of 9-11. What can I tell you about that day, experience and the impact on my life? It showed me that I could depend on Alan in case of a major emergency. Isn’t that what you want from a marriage minded life partner? Ask yourself this Relationship Question: Who is in your support system?